Karoda is a very tart berry (Carissa caradas) that appears in the Indian markets in the last leg of summer and continues till late August. We had a huge bush of this berry back home and our dog use to chase the birds that used to nest in that bush. 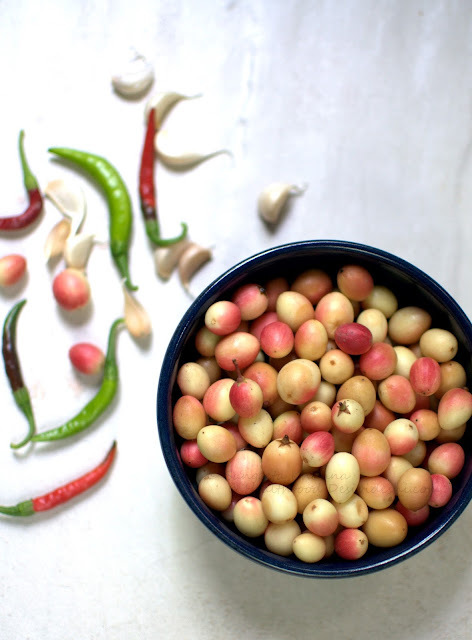 A lot of pickles, chutneys and jams used to be made using karonda in those days. We have used these berries to practice targets and it's fruiting branches to decorate flower vases. 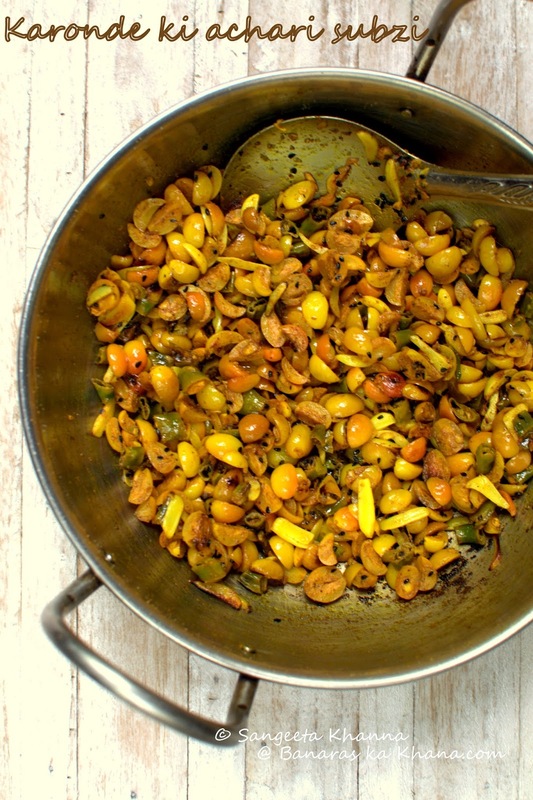 Karonde ka murabba is a popular condiment in some homes and is used as substitute for tinned cherries to make cakes etc. I think you can still find karonde ka murabba in the markets of Banaras. We never cared for keronde ka murabba though. 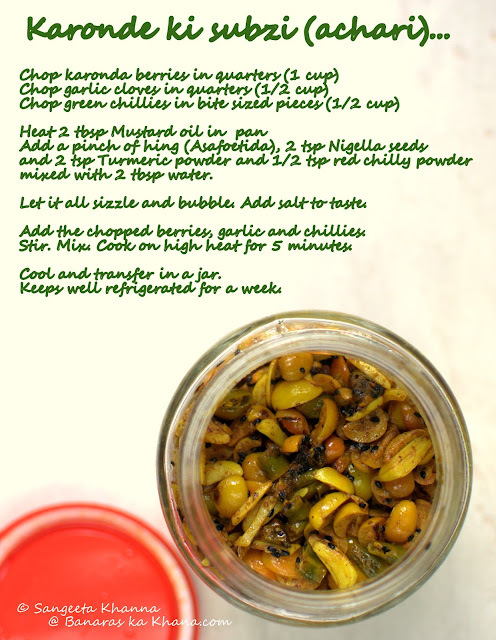 This subzi is nothing but a simplified pickle which is cooked quickly and is refrigerated for a week, to be served with almost all the meals during that time. Back home there were several of such achari recipes that my dadi (grandmother) used to make. She loved such hot and sour condiments herself and used to love serving 3-4 such condiments with each meal. In modern times such condiments are more convenient as we sometimes resort to simpler one pot meals and any such pickle in the fridge can jazz up any simple meal for sure. I am reminded of and have been craving for my dadi's stuffed green chillies that was always there in the fridge whenever she stayed with us. I must add that I remember my dadi for so much more than just the food, but I would agree food was a very tangible connect that established so effortlessly and we tend to bring that back whenever we can. My grandmother shaped my life by default and she continues to do so even though it has been 16 years she is no more. Whenever I cook or write about such recipes I do remember her earnestly. 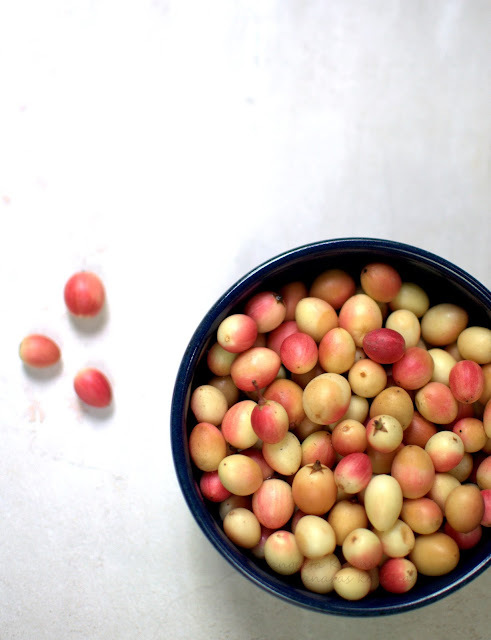 Coming back to karonde ki subzi, I know it is a pain to chop such tiny berries. But once you get to chopping the beauties they don't disappoint. You could sit with them to watch TV if possible. This activity used to be a meditative exercise in older days as I understand. Women used to chit chat while chopping vegetables often and that must have been great stress buster and bonding activity. For this kaprinde ki subzi you have to peel some garlic and chop them too. Thankfully I have a maid who helps and I just cooked this subzi in about 5 minutes. Total time that karonde ki subzi needs after chopping them is just 10 minutes, so try and get it done if you are drooling at this subzi. This subzi is called acahri for obvious reasons. It tastes like achar but doesn't keep well like 'achar'. Another quick karonde ka achar is made in season too that lasts a bit longer but if the pickle needs to be preserved for a year it needs some preservation either with vinegar or more mustard oil and salt. So you see you just have to flash fry the karonda, garlic and chillies along with a tadka of hing, kalonji (Nigella seeds) and turmeric chilly powder mix, and the subzi is ready. Heat the mustard oil and tip in the hing and nigella seeds. Now make a paste of turmeric and chilly powder with 2 tbsp water and pour it in the hot oil. Let this mixture sizzle for a while till the oil separates or the mixture gets shiny. Add salt to taste. Now tip in the chopped vegetables, toss and cook on high heat for 5 minutes. Cool and transfer to a glass jar or container. Serve as required. Do let me know when you try this karonde ki subzi. You can make similar subzi with chopped raw mangoes which was called as aam ka kuchla back home. Some people would call this karonde ki subzi too as karonde ka kuchla. Thank you Sangeeta for this recipe! Brings back a lot of memories of a very special aunt who used to make it regularly. Am going to share it with my mum as well. This one is for keeps! Liked yr recipe. I make dal out of this subzi and also a curry with lots of onions and add few to brinjal curry as well. Would love to know how you make a longer lasting achar.